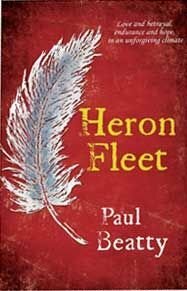 Heron Fleet - Paul CW Beatty Books etc. Not far in the future, Francesca is an apprentice in the idyllic, agrarian community of Heron Fleet. She loves her impetuous partner Anya and the community acts as mother and father to her, as its founders intended. But outside Heron Fleet, the world is violent. Only a remnant of city populations, organised into violent despotic scavenger gangs, cling on by combing through rubble in search of food. They are the survivors of an ecological disaster. The causes may have been forgotten, but the climate suffers with harsh, cold winters and short, hot summers. Between these two worlds, Tobias trades food gathered from agrarian communities for raw materials from the cities. But most of all he seeks books that might help him understand what happened to the climate; he believes that if humans are to have a long-term future, the agrarian communities must expand. Francesca rescues Tobias when his boat is wrecked by a storm and his arrival coincides with a crisis in Francesca and Anya's relationship. This pushes Heron Fleet into turmoil, which threatens the community's cohesion and casts doubt on the ethical basis on which the community was originally formed.